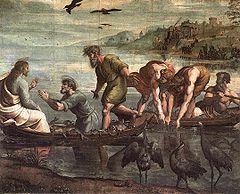 Miracle on Lake Tiberias by Raphael – 1515. While I cannot speak to how a cannibal cooks a missionary, I have cooked on an open fire but never fish. Further, if you cook anything on an open fire I suggest you do it carefully. If you have a pan and some butter, fish can be fried on an open fire otherwise I suppose, the fish has to be skewered and cooked like roasting hot dog. I wonder what we call it when a fish is on a skewer over an open fire; is it broiled? I have never had much success cooking over an open fire. I believe I would have been an unsuccessful cave man. Usually, I do not think of fish as breakfast fare. However, in the Gospel according to John, in an after resurrection appearance, Jesus is reported cooking fish on an open fire by the shore of Lake Tiberias—apparently for Jesus it was and suspect in many parts of the world it is breakfast fare. On my Face Book page someone has posted a painting of Jesus at Lake Tiberias with his disciple and captioned it, “Breakfast with Jesus.” The picture depicts Jesus hunkered next to an open fire “broiling” fish and his disciples are gathered around. When I was at Lake Tiberias, I recall seeing people eating fish that looked delicious. I say, “Looked delicious.” I did not eat any; therefore, I have no idea what it tasted like. The fish on the platter had a dark brownish, gray skin. The fish was large in that it filled the platter, and when cooked presented to the diner a flaky white meat. It is called, so I was told, “St. Peter’s Fish.” I think the name was given to the fish for my benefit. I do not know what the technical name of the fish in Lake Tiberias is—it is probably tilapia. Readers of the four gospel accounts of Jesus’ life in the New Testament should notice that encounters with Jesus before and after his resurrection frequently include food and drink. In the instances where food is the essential element of the encounter, he takes food, blesses food, and distributes the food, and in his post resurrection appearances he eats food. The Holy Eucharist recreates these actions: The priest takes the bread and wine as a gift of the people, blesses both, and then distributes the bread and wine to those present. Additionally, the stories of Jesus after the resurrection demonstrate that the disciples did not encounter Jesus as an apparition or a ghost. He is there before them in the resurrected body talking, walking, and most importantly eating. Ghosts, apparitions, do not eat and have no need for food. During the fifty days of Easter, the Scriptures report more story of the resurrected Christ. Appearances of Jesus and encounters with him are physical. He invites Thomas to touch him and to place hands on his wounds. He somehow joins two men walking to a place Emmaus and breaks bread with them. And then later, somehow, he is at Lake Tiberias providing instructions on improving fishing techniques on Lake Tiberias where he builds a fire on the lake shore, broils fish, and then feeds his friends. In the Acts of the Apostles we have another post resurrection encounter. This encounter is a mystical one and as the others were unexpected this one, because of whom Jesus encounters, was unforeseen. Jesus appears to Saul of Tarsus, a terrible persecutor of the disciples of Jesus. As Saul travels to Damascus to arrest followers of the Way, Christ meets him on the road and changes his life. Who would have thought this person would be the one Jesus calls to be an apostle? Saul was a rabbi, a person learned in the Torah and the Jewish law. In his and the Sanhedrin’s view the people of the Way were heretics advocating against the teachings of Moses. Christ’s encounters with his disciples and later to Saul, who becomes Paul, confirms the veracity of the Christian claim of the resurrection—these encounters point to the fact that Jesus lives tangibly in the world. Further, the world is often surprised when the reality of the living Christ intervenes in the world. Nonetheless, the skeptics remain skeptical and others wonder in awe. However, Jesus lives in ways and in places unexpected and in hearts and minds taken off guard by the challenges of faith. Jesus appears in a variety of unexpected and often unforeseen ways and places. Sometimes Jesus is encountered in the form of those in need. Often Jesus is encountered in the form of someone answering a need. At times the reports of such encounters seem miraculous while in others seem mundane. When Jesus makes himself present in people’s lives, something new always happens. Regardless of the nature of these encounters, every meeting with Christ, whether by a new understanding of the Scriptures, the words of a caring person, or even the chance of circumstance, is a miracle. This is not a word for word quote. It is presented only as I recall Harrison Ford’s words. Acts of the Apostles 9:1-20.